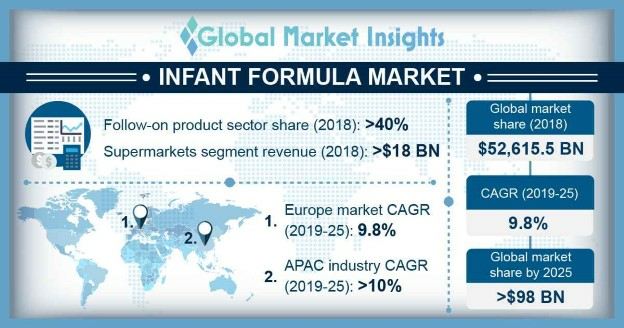 Global Infant Formula Market size is forecast to exceed USD 98 billion; according to a new research report by Global Market Insights. Global infant formula market will be primarily driven by the growing number of working-class women across the globe. Infant formula are widely accepted alternatives of breast milk hence the rising population of working mothers shall drive product demand during the forecast period. Moreover, the increasing per capita income in developing economies has resulted surge in the purchasing power of the population which in turn is anticipated to act as one of the major market driving factors during the assessment period. According to The Federal Food, Drug, and Cosmetic Act (FFDCA), by U.S. Food and Drug Administration, infant formula is defined as a food which purports to be or is represented for special dietary use, solely as a food for infants by reason of its simulation of human milk or its suitability as a complete or partial substitute for human milk. Infant formula consists of various vital ingredients such as fats, carbohydrates, proteins, minerals, vitamins and others which acts as an import source of infant nutrients. Although, breast milk is highly recommended by physicians as the best source of nutrients for infants however, the product acts as an effective substitute of breast milk. The rising awareness about baby health coupled with growing infant population across the globe shall substantially boost the infant formula market size through the review period. The global infant formula market is highly regulated with various regulations laid down by The Center for Food Safety and Applied Nutrition under the U.S. FDA. It lays down regulations regarding the nutrient specifications in baby food products. These regulations also mandate the maximum and minimum ranges of necessary nutrient content in infant formula products. According to the FDA regulations, the nutrients specifications includes minimum ranges of 29 nutrients and mentions maximum limits for nutrients permitted to be used in infant nutrition products. On the basis of product, the infant formula market has been segmented into standard, follow-on, toddler and specialty. Among the aforementioned segments, the follow-on segment generated maximum revenue over USD 20 billion in 2018, whereas the toddler’s segment is likely to exhibit the highest CAGR over the forecast timeframe. The rising disposable income across the globe along with the growing adoption of infant formula are major factors augmenting the infant formula market size. On the basis of distribution channels, the global market has been segregated into hypermarket, supermarket, convenience store, online and others. Among the aforementioned segments, supermarkets contributed highest to the revenue share amounting more than USD 18 billion in 2018 and will hold the highest revenue share throughout the assessment period. The growing penetration of supermarkets in the developing economies along with the presence of various sales promotion schemes attracts large consumer groups which in turn is positively contributing to the growth of the supermarket segment. Asia Pacific is projected to be the major revenue pocket during the forecast period and shall exhibit highest gains over 10% CAGR in terms of revenue. Growing number of female workers coupled with the increasing middle-class population shall boost the product demand during the assessment period. China, India and Japan shall be major revenue generating countries in Asia Pacific over the coming years. Moreover, the growing government spending in the development of retail sector in the region has made the availability of consumer goods easier, which will augment the product demand. Europe held the second most revenue generating market position in 2018 and is projected to display the same trend throughout the forecast period. The proficient players operational in infant nutrition market include Nestlé, Danone, Reckitt Benckiser, Abbott, Perrigo Nutritionals, Arla Food Ingredients, Hero Group, HiPP, Otsuka Pharmaceutical Co. Ltd. and Bubs Australia.